Today is a very special day…. Today marks a very very special day in the Arsenal calendar. It’s a day for true Arsenal fans to give a thought to one of our own…….. Raise a glass, remember a goal, remember a special piece of magic….. and there were many….! Most of all though remember the man himself – Mr David Rocastle. Rocky has been gone nine years today….!. I bet most of you will know where you were and what you were doing when on that fateful day we heard the news that Rocky had passed away…………! I was devastated……….. How, why……………. so young……….. I felt an emptyness and I think I still do, why exactly, well because the man was proper Arsenal, he was one of us, a down to earth Arsenal fan, he lived the dream he was also a true legend, an Arsenal great…!. What we saw on the pitch with Rocky we could all relate to. He was Arsenal, cut him open and he was red and white inside just like us. He had passion for the club for the team for the shirt and for the fans, you knew he was upset when we lost like we were, he was overjoyed when we won just like we were and he fought for every ball, ran until the last second of the game and he gave it all for the club he loved because it was his club and our club. Name one player now who would cry when told that they were being sold ? The only reason they would cry now is the thought of earning less money maybe. Rocky cried because he was torn apart, torn apart because Arsenal, his club, were selling him. So Just who is David Rocastle? Rocastle was born at Lewisham on 2 May 1967. In the summer of 1983 he joined Arsenal as an apprentice and spent two years in the youth team before signing a professional contract just before the start of the 1985-86 season. Rocastle, or ‘Rocky’ as he became known, made his Arsenal debut in a goalless draw against Newcastle on 28 September 1985 and soon became a regular member of the first team. In 1987, just before his 20th birthday, he helped Arsenal to a famous League Cup Final victory over Liverpool, their first trophy in 8 years. This was followed up by another League Cup Final appearance a year later, but this time Arsenal surrendered a 2-1 lead to lose 3-2 to a last minute Luton Town winner. Despite that defeat, Arsenal were on the up and, along with other starlets like Tony Adams, Paul Merson and Michael Thomas, Rocky was part of a young Arsenal team that were destined for greatness. When did Rocky win his first league medal? In 1989, Rocky and his teammates tasted major glory, winning the clubs first League Championship since 1971 and in dramatic fashion with a goal in the last minute of the last game of the season and against their nearest rivals Liverpool. To this day, it remains the most exciting finish to a league season ever and will probably never be matched. This success was followed up 2 years later when Arsenal once again were crowned champions, this time in even more convincing fashion, losing just one game all season. Unfortunately, injury meant that Rocky’s contribution was limited to 18 appearances during that time. By the age of 24, Rocky had been an integral part of a team that had picked up 3 trophies in 4 years. His huge contributions were well documented and on 14th September 1988, Rocky was selected to play for England for the first time, in a 1-0 victory over Denmark, which also provided debuts for England greats Paul Gascoigne and Des Walker. Rocky was destined for a long and successful career on both the domestic and international stages. However, in the early 1990s, he suffered a series of injuries which began to hamper his game and in 1992 he was transferred to Leeds, much to the dismay of all Arsenal fans, by whom he was adored. Life for Rocky after Arsenal? After leaving Arsenal, Rocky played for a number of other clubs, including Leeds, Manchester City and Chelsea, however, the fans of these clubs only saw the Rocky magic in fits and starts as his career continued to be blighted by injury. In 1999, after further short term spells at Norwich City, Hull City and Malaysian outfit Sabah, Rocky succumbed to his injuries and was forced to retire. In all Rocky made 14 appearances for his country, a staggeringly low total for a man with his talent! Despite leaving Arsenal in 1992, Rocky forever remained a part of the Arsenal family. The fans loved him not only because of his brilliance on the pitch, but because he played the game with a smile on face and his heart on his sleeve, more than that, he always conducted himself as a gentleman. In February 2001, Rocky announced that he was suffering from Non-Hodgkins Lymphoma, an aggressive form of cancer that attacks the immune system. He underwent a course of chemotherapy and thousands of fans prayed for his recovery. This was a battle that was too much, even for David Rocastle. Rocky passed away on 31st March 2001, aged just 33. What did David Rocastle represent? 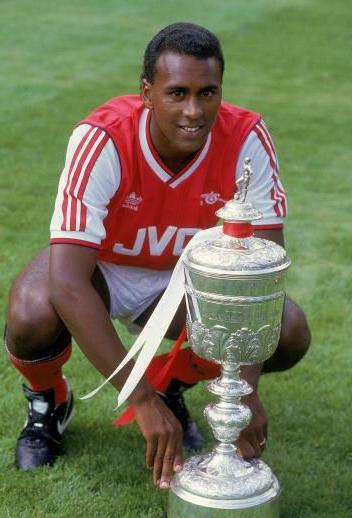 David Rocastle represented everything that was good about football. Honesty, passion, teamwork, commitment, and of course, sheer brilliance, we believe that this is why he remains in the hearts and minds of all Gooners who were privileged to see him play and who continue to sing his name, even today. Nine years have flown by and we all know he would of walked into this current side, can you imagine that….? what a sight that would of been…!. RIP Rocky, gone but never forgotten and today of all days it would be rather fitting if the team gave us a perfomance that Rocky would also be proud of..!